A party bus for you and your friends sounds like a blast, doesn’t it? But if it isn’t your 40th birthday or your bachelor party, you might be wondering if there is a good reason to get your group together on a luxury party bus. Wonder no longer. We’ve got a guide for you that will help you find the best places to head out to so that you and your friends can take full advantage of everything our party buses have to offer! Whether heading into New York for a show or a night hitting the hottest clubs, a party bus is the only way to go with a group. Imagine being able to relax during the two-hour drive from Philly to the Big Apple with twenty to forty of your closest friends. Plan a group trip for a Broadway show, get ready to see the biggest concerts at Madison Square Garden, or bar hop from one Manhattan club to the next. All without having to find parking or worrying about a designated driver. AC. The boardwalk. The gaming. The concerts. The events. There are so many reasons to head to Atlantic City with friends. Well, except for trying to coordinate rides. And the hour drive. Instead of stressing about a trip to AC, make it an event! Head to see the fights with the guys or gather your friends and family for dinner and a concert. Spend the drive there hanging out with friends instead of getting frustrated by traffic. Don’t stop the party because it’s time to head home – put some music on the party bus sound system and keep dancing, while someone else ensures you and everyone else gets home safely. Philadelphia has a lot of great casinos nearby that make for a fun night out for a group. Maybe you’re thinking of heading to Valley Forge Casino, or over to Parx. Perhaps SugarHouse is on the list, or Harrah’s. Instead of having everyone meet there, make it a win-win and hop on a party bus. You can even make it a day and hit up all of the tables and slots as you tour the local casinos. Take a party bus, and when you’re done at one casino (or should we say won? ), you can relax and continue the party as you head to the next. What’s the worst thing about a pub crawl? Transportation. Either someone needs to be the designated driver, or everyone has to whip out their phone to try and get a ride share. If the group is large, getting enough Ubers to get your friends from one place to another can be outrageous. And don’t even think about trying to get parking in downtown Philly on a Friday or Saturday night. Your answer to a fun and stress-free bar crawl is a party bus. Not only do your worries about parking and safe rides go away, you can keep the party going as you head from one location to the next. So whether it’s an ugly sweater crawl for the holidays or a historic bar crawl through Colonial Philadelphia, a party bus makes it a trip to remember. There are so many places to see a concert in Philadelphia, and so many shows to take in. From smaller venues like the Ardmore Music Hall to giant amphitheaters like the BB&T Pavilion or the Fillmore, concerts in Philly are epic. Don’t wait to get the venue to start the party – get on the bus! 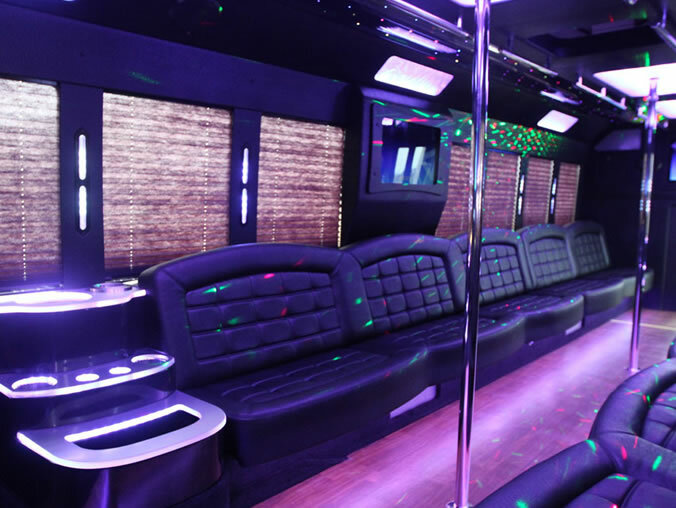 A party bus will get you and all of your friends to and from the concert in style. Pre-game in the bus’s spacious lounge area and continue dancing to your favorite songs after the concert is over. Chic’s buses come with great sound systems, laser lights, and even poles! Phillies and Flyers and Eagles – Oh My! There’s nothing like tailgating with your friends before an Eagles game or heading to the ballpark on a beautiful summer’s day to watch the Phillies play. Hockey more your thing? Seeing the Flyers play is heart pumping. But parking is expensive and a hassle. You can only start the party once you’re at the game. Keeping everyone together to keep the celebration going can be tough. But not with a party bus. Start the party watching the pre-game show right on the bus. Pull straight up to the gate for door-to-door service. And keep the celebration going after the win with lighted bars, sound systems, and big screen TVs. Whatever event you’re planning with your friends, do it in style and ease. Plan a unique night out on a Chic’s Party Bus!